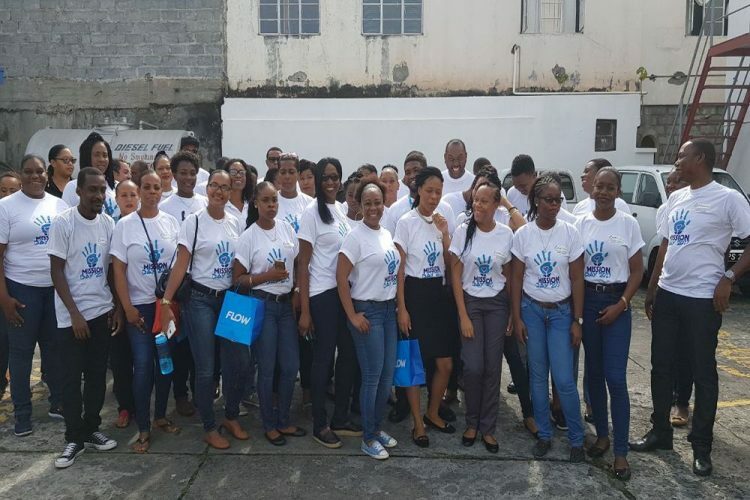 Telecommunications Giant Flow continues to prove they are the leaders in every sector in St Vincent and the Grenadines (SVG), with the hosting of a live, public, Chinese auction and food sale. The Chinese auction and food sale took place on November 16, as part of the companyâs annual mission day initiative. This year, Flow is focussing on the devastation in Dominica, where 90 per cent of the country is still without electricity after the passage of Hurricane Maria. Many buildings were completely destroyed and virtually none were left untouched. Officials put the death toll at 27, and more than 50 people remain missing. With the sheer scale of the devastation hampering relief efforts, officials believe the recovery process will take several years and billions of dollars. As a result, Flow SVG thought it a priority to donate as much as possible towards the replenishment of much needed goods and supplies to this shattered country through the Chinese auction and food sale. The Flow team reached out to scores of businesses in and around Kingstown, asking to donate one or more items and services for auction. The response to the idea was overwhelmingly warm. The items auctioned ranged from a stove, to kitchen and household appliances, bedroom makeovers, radio advertising packages, spa treatments and much more. Due to the attractive items, the event drew well over 1,000 persons. Bidding started at $5 and all food and drinks were sold at $5, which accumulated near to $6,000 in funds. In addition to its recently announced relief efforts in the aftermath of Hurricane Irma and Maria, including expertise deployment, humanitarian aid drops and free calls for impacted customers, C&W Communications (C&W) launched the Cable & Wireless Charitable Foundation with seed funding of US$500,000 to help support humanitarian efforts across the region.